This is the kind of fight Kamaru Usman wanted, and while Demian Maia may be even more of a stylistic puzzle than his original foe, Santiago Ponzinibbio, “The Nigerian Nightmare” is well aware that this main event slot is his opportunity to make a statement and put himself in a position where he won’t have as much difficulty finding opponents as he has in the past. He still has to get by Maia, though, and there’s no one better at making an opponent pay for a mistake than the BJJ wizard is, and this is a big opportunity for him as well to get back in the title race. With Alexa Grasso and Tatiana Suarez both in the strawweight top 15, we can’t really call them prospects anymore, but this is the biggest test for both, with the winner emerging as a legit contender at 115 pounds. On paper, it looks like the classic striker vs grappler clash, but if Grasso can’t keep it standing or Suarez can’t get it to the mat, who wins? That’s the big question, and I have to lean towards Suarez on the feet over Grasso on the mat. Fun battle at 205 pounds between Dominick Reyes and Jared Cannonier. Reyes has looked spectacular in his first two UFC bouts, but Cannonier has the type of durability and power to make anyone second guess themselves. This will go a long way towards seeing just how good Reyes can be in a light heavyweight division that can use some young stars. The loudest roar of the night will likely be reserved for Chile’s own Diego Rivas, and deservedly so. He’s come up the hard way to get here, and after battling and beating cancer, he’s become an inspiration both at home and abroad. So does he get the win in his homecoming? His former TUF LATAM teammate Guido Cannetti will put that friendship aside to try to spoil Rivas’ night, and it’s going to be an evenly matched battle for 15 minutes or less. With the hype around the debut of highly-touted Andrea Lee this weekend, a lot of people have forgotten that Venezuela native Veronica Macedo had a lot of hype around her when she debuted in the Octagon in 2016. Of course, Macedo lost that debut to Ashlee Evans-Smith and has been nursing injuries since then, but she’s still got the talent to succeed and she’s only 22, so this will be a fight on Saturday, which is just what the well-rounded “KGB” Lee wants. Galore Bofando on 12/16/17 in Winnipeg, Manitoba, CA. 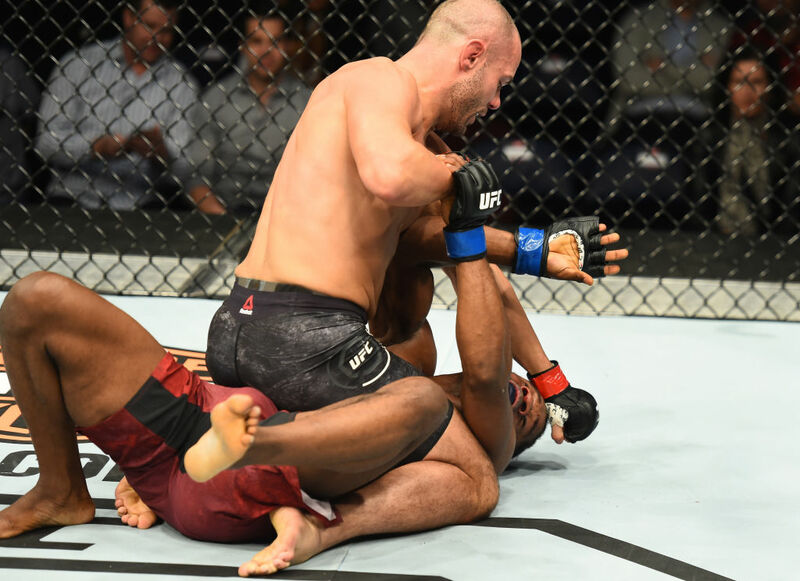 (Photo by Josh Hedges/Zuffa LLC)" />Perhaps the best fight on Saturday’s card, Vicente Luque and Chad Laprise are finishers who are on the verge of big things in the stacked welterweight division, and the winner here may be knocking on the door of the top 15. Both are aggressive, exciting fighters, and in the Fight of the Night sweepstakes, this is a good candidate. Michel Prazeres is the biggest question mark in the welterweight division, making Saturday’s bout with Zak Cummings one of the most intriguing on the card. A huge lightweight whose strength and swarming style led him to six straight wins in the division, Prazeres’ difficulty hitting 155 forced him to welterweight. So will he be able to dominate at 170? Facing Cummings, a big welterweight, will answer a lot of questions. In 2016, Alexandre Pantoja sent Brandon Moreno out of the TUF 26 flyweight tournament, and almost two years later, here they are again, and we’ll see if it’s repeat for Pantoja or redemption for “The Assassin Baby” this weekend. I’m leaning toward redemption, because Moreno is clearly evolving with each fight. That doesn’t mean Pantoja isn’t doing the same, but what was a competitive fight the first time could very well go in the opposite direction if Moreno continues to take things to another level. The great boxing trainer George Benton famously said, “Win today, look good next time.” Well, it’s next time for strawweights Poliana Botelho and Syuri Kondo. 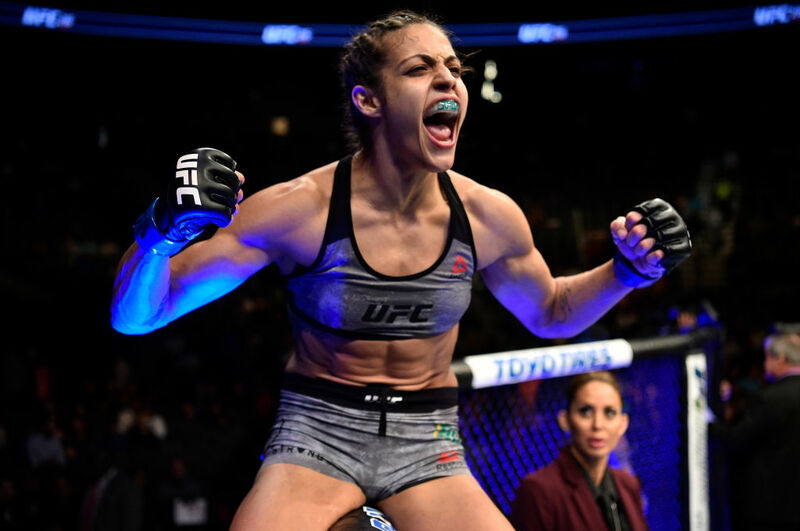 Both pulled off hard-fought wins in their UFC debuts last fall, and now they’re back with the opportunity to keep their momentum going and make a case for a spot in the 115-pound top 15. Humberto Bandenay needed just 26 seconds to finish Martin Bravo in his short-notice UFC debut, but that was in August 2017. On Saturday, he makes his return to the Octagon, and it’s a tough test for the Peruvian prospect, as Gabriel Benitez is a seasoned vet coming off the biggest win of his career over Jason Knight in December. A victory like that can take a fighter to another level, confidence-wise, so Bandenay will have his hands full for sure. Winner of three straight, former TUF LATAM 2 winner Enrique Barzola has been flying under the radar, and while a fourth consecutive victory likely won’t push him into the top 15, if he delivers a memorable performance against a fighter who is beginning to get a reputation for such efforts, it will likely get him a contender the next time out. Fights that seem destined to go the full three rounds can often be the kind where you get up to grab some food while a war of attrition ensues. That’s not the case here. In fact, given their styles and durability, it wouldn’t surprise me if Henry Briones and Frankie Saenz make an early case for a Fight of the Night bonus. After his run through the field on TUF Latin America 3, Claudio Puelles was expected to do the same in the season finale against Martin Bravo, but Bravo had other plans, stopping the Peruvian phenom in the second round. It’s been 18 months since, and Puelles finally makes his return against Brazil’s Felipe Silva. Silva is a Muay Thai knockout artist, and if Puelles isn’t back in business following the loss to Bravo, Silva will find out in a hurry.